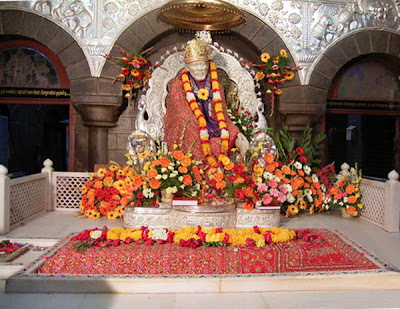 A new service by Sri Sai Baba Sansthan of Shirdi is making stirs on web, the live darshan of Samadhi Temple and DwarkaMai or Masjid Mai. Darshans are shown live from Indian Standard Time 5.00 morning to 10.20 night (Indian Standard Time) with a time offset of UTC+5:30. , when the Mandir is open for darshan. When visiting Sri Sai Baba Sansthan Trust's website be sure to visit the link from internet explorer browser. The darshan video feed does not work in Mozilla firefox browser. The video works in google chrome browser. Online darshan on google chrome is a better experience as the browser comes with minimum fuss, nice simple white background. Live online darshan of Shiddhi Vinayak Temple of Mumbai also called Mumbai Cha Raja click here. I have to thank you from the bottom of my heart for bringing my beloved SAI live into my home.I have been trying for days to get the live darshan( online ) of shirdi but somehow i wasn't successful.I felt unhappy and thought in my mind that may be i am not that lucky enough to see it.But now on this happy occasion of hindu new year i just came across your blog and LO! SAIBABA WAS THERE VERY MUCH LIVE.I am so happy i cannot describe my feelings.Thankyou SAIBANDHU . Great job for the benefit of devotees.. Thank you for the live darshan. Its beautiful. Its make me happy to listen to the darshan. I dont know how much to thank u. By any chance do you have any idea about the Chant they play at Samadhi Mandhir between 7pm and 8 pm? I've asked a few devotees about it but so far no avail. Wonder if that divine music is available anywhere in stores! I don't know which chant's you are talking about. Download Audio on the links of Audio provided by Shri Sai Baba Sansthan you might find it. 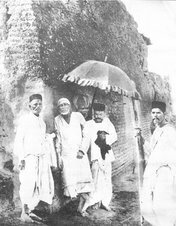 As Sai Baba Sansthan have put almost all the audio files played in Shirdi, on it's site. I've checked out the audio section long back but it's not available there. I went to shirdi in Feb where i heard this music for the first time. It's played everyday in Samadhi Mandhir between 7pm (India Time) before live Bhajans. Just check out live dharshan by that time and you'll hear it. Am sure you'd be addicted to it. Ok i will check that out, right now my speakers are given for repair so cannot listen. Will do so as soon as i get them. 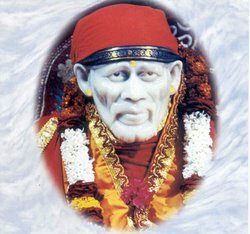 Have a feeling in my heart that will be visiting Shirdi Shortly, :) then may be will listen to it Live in Shirdi. :) :) :) , and call me Alpesh that much is enough my friend. Such a desire is enough for Baba to pull you there! You have a nice blog...quite informative! Good luck for this Sai Seva! Thanks Alpesh for providing the link. The experience of darshan cannot be explained by words. Thanks for the site. The Samadhi view is fixed and only the Sanctum Sanctorum is visible. In contrast the Dwarkamai site provides true movie. At Samadhi site during Arti the Priest stands in such a way that the view to the deepak is blocked. The angle of the camera or the Priest be changed and fullview of moving devotees with keep one glued to the site.Is it possible? i am not able to view the videos at all. though i have a higher version of the player, it throws error. even in the sai's site, it doesnt play but doesnt throw any error msg. Hi 1 week onwards link for live darshan of samadhi temple is not working. Problem is not connecting. Oh Sai, I know you are with us but sometimes i start thinking about my and my husbands future. Please help us and give us for which i have been praying from a long time. Thank u very much for this link, we are very much exited. Sai Baba will bless u.
thank u so much for making it possible to experience baba's darshan though far from shirdi, baba will belss u for sure. a small problem though im having problems in getting the connection after a week and keeeps giving me error message pls help. Nice site,nowadays i am going thru tremendous situation,i pray no one shud go thru such.Parents of my love donot agree to our marriage,n emotionally pressurized her by threatening her of their life if she marry me.now she had decided n send me msg thru her friend to forget her,she cant marry me.But only we now what we suffering every moment.I have faith in saibaba, i pray him every moment from depth of my heart.I request you all to please pray for us.I want my true love back n her parents accept us n everything should be ok.
i watch the live darshan everyday with baba's blessing but one thing really bothers me, if you can tackle this then it would be really appreciated. I dont agree at all the way the pandits throw har and flowers on samadhi when accepting from devotee's, seems very unrespectful. thats baba's samadhi and baba is there still so how do u throw smthng on top like tht???? please if you can try and stop that, lets be more respectful. I'm not able to access the above links. None of them are working for me. Please let me know the working links. It will be very very... to me. 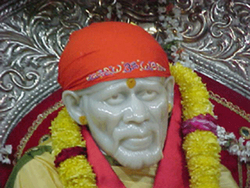 The links are provided by Shri Sai Baba Sansthan Shirdi. Keep trying it should work in few days. This happens a sometimes, that the links does not work. 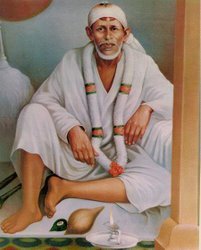 may sai bless you for the good job that you are doing. I PRAY TO SAIBABA TO GIVE MY DAD AND MUM LONG LIFE TO LIVE IN SUKH OR DUKH AND FORGIVE THEM FOR ANY SINS THEY HAVE DONE OR GONE THROUGH IN THEIR LIFE TO HIS SON AND FULFILL ALL THEIR WISHES IN THIS WORLD. Baba i pray to you please take away all the pain that comes in my parents way and all the suffering and illness they have kindly cure it and let them always be happy. Also can u tell me which chant do they play at Samadhi Mandir between 7-8 pm??? "He will bring u to it & he will bring u through it"
And then we will be one for eternity. Please bless me with good job and protect our family. Please forgive for whatever wrong things i have done in the past. You are everything to our family and your blessing and guidance is much needed. Thanks a lot for the links. Have been looking for a long time for it. May Sai's blessings be bestowed upon u always. we watch the live darshan at Baba's Samadhi and see how people are in such high degree of disorganised circumstances and push you push me and lots of jostling...........why dont the security we can see in caps and uniform allow only five persons from each queue to approach the samadhi platform so this jostling stops.....please contact Shirdi authorities and show my mail as example.....please more people write about this.......more peace at baba's Samadhi. I do understand your concern, It is a sacred pace where devotees should get some time with peace of mind to get the darshan. You can directly write to the Sansthan about the same. I think it is quit difficult. Many years ago i almost had a feud with a security guy at GuruSthan where he was constantly shouting and pushing the devotees to move away soon. i started shouting at him to stop the noise he was creating and let the devotees have the darshan in peace. No sooner did i started shouting at him, other devotees obviously getting tortured by his constant shouts joined me and he had to keep quite. But these days it will be a huge task. The crowds in Shirdi gets bigger and bigger. There are many security guys working, Sansthan should have few training sessions for those working there and make them understand, that the devotees coming to have darshan should be treated with respect. Somehow it becomes impossible when there are 100s and 1000s of devotees queued up and some would be getting the Samdhi darshan after hours of waiting in the queue. Once i attended Bhauji's talk. He was talking about the future of Meher Baba's Samadhi. He said that at Samadhi it is the perfect Master or avataar who does the work. Each one reach the samadhi when they are called. There might be instances when after long waiting the devotee or spiritual seeker might not even get a glimpse ot Samadhi. But it is not the devotee or seeker that does the work there. Even if the one taking darshan cannot get a glimpse the perfect master (Sai Baba of Shirdi in this case) has already given him/her the spiritual push needed for him/her. Thank you, Alpesh. You are right on all you say and especially what you say about reaching Samadhi only when you are called and even those who do not reach, it is only the will of the Perfect Master, but the spiritual push is given, you are right. Thank You So Much for giving these links. 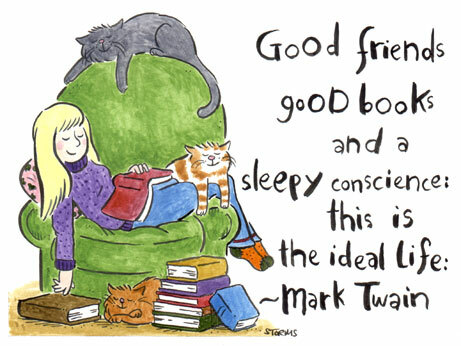 it is very awesome. Please god help me. Thank u sooooooooooooooooooooooooooo much for such a beautiful, delightful and satisfying darshanam. it is very usefull. Please god help me. How will poor people like me reach Baba .. Please tell samsthan tell our tears.. Our poor tears..
Somebody who is a member of the Samsthan Trust please take this forward and Help the Poor like us ... We need Baba like everybody.. We dont have money to Give to anybody to any Pujari or security .. Yes the points in your comments are heart touching. But don't lose heart. Baba is with the meek and poor. Meek and poor in terms of ego. Baba is always with them who love Him dearly and your words and pain shows the love towards Baba. VIP may get a place in Dwarkamai or a place neat Samadhi during Aarti, but only those who love Baba, Baba takes place in their hearts and is always with them. 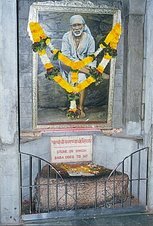 Baba is not limited to Samadhi Temple and Dwarkamai. If you love Baba dearly He is always with you. Baba's real place is in our heart. So keep Him there all the time. Also if you like to sit in Dwarkamai go there after 10 in night. 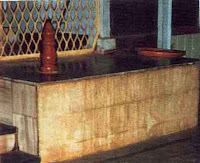 The outer place where Baba used to cook, The stone on which Baba used to sit. This place remains open whole night. So you can sit in peace and be with Baba. Don't rely on somebody to do something. But pray to Baba and rely on Baba only. All Baba needs is intense love and devotion. So all kind of intensity we get should be directed to Sai Baba. Thanx for the wonderful work Apleshji..Today I started reading Sai Satcharitra and I got darshan online also..So much peace of mind today..
please remove the ad window "when will you die? "- the hideous evil sounding voice and the profile of a devil is not befitting this sacred and beautiful site. if you can send me the url of website that advertise i can block it. You can email for the same. It's done Mr Nariewalla thanks. 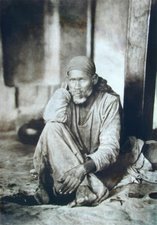 no one has observed/discussed why no individuals or family ever came forward, in Sai's lifetime or later, to claim that Sai Baba is my/our son, sibling-brother, or cousin or distant relative, or from my village/town. Really very awesome, a great mystery we will find hard to solve. Yes Mr. Narielwalla and when such question was put to Sai Baba himself. He looked in the eyes of the questioner and he/she would bow in silence. So it is enough for us that He is the Universal Perfect Master, and relative to all of us. Helping each of us in various manners. 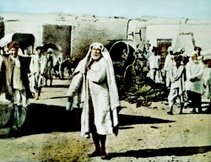 this site is a wonderful medium for sai bhaktas to connect with sai baba.OM SAI SHIRI SAI JAI JAI SAI. Om Sai Ram, please guide us. Please forgive us. Please bless us. Please accept our love. Please accept our donations. Om Sai Ram, Om Sai Ram, Om Sai Ram, Om Sai Ram. hellow do you have any idea which company is providing us this live darshan service. I got a nice experience during my visit to Shridhi in the year 2006,it was rich in faith and people there are still living in the ancient style.Iappreciate it a lot.Whenever I the live darshan there's a feeling that I am there. Would like to get one more chance.Wish BABA bless my family. I thank you whole heartdly for what ever you have and doing in my life. Thanks a lot and i want your blessing on me and my family forever and please give strength on the situation what i am facing now. i know you will take care of this situation soon. C.P.Rao. Senior journalist, Chittoor. Andhra Pradesh. Sai Baba is everything for me..
Sai listen to each and every person who speak out baba's name heartly..
i want to tel u one thing open heartly.last year i got sick like anything and then i came to india.bcos i stay in singapore and i am housewife and i got one child(4 years).then i decieded to cut my feet.but me and my mother pray to baba.then suddenly somebody say one homeopathy doctor is there then he can solve my problem.c how baba creat,really its a miracle for me.finally i meet the doctor,he gave some medicine.i use that medicine now i my health is perfectly alright.i am so happy.now i my pooja mandir and alover at my home baba photos only. then i back to singapore i conduct sai baba bhajan now u know my husband buy house here.i am so happy now.bcos of baba only. 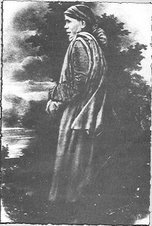 When you came to me I could not recognize you for which I beg you to pardon me and come again to see me. plz baba meri shahaita karena. Unable to view the live darshan,from past two weeks,please let us have the oppurtunity to have BABA's live darshan...eagerly waiting to see you BABA. The link to live darshan directly via windows media player or similar software was here on the blog. Benefit was we can have live darshan in full screen. This service is provided by Shri Sai Baba Sansthan (Shirdi) and due to heavy traffic they have opted for live darshan in small window. So the link is not working. You will have to visit http://www.shrisaibabasansthan.org/shirdilivedarshan1.htm for live darshan. I am unable to get online darshan. Please give alternate links, if any. Iam unable to view the online darshan..I implore everyone to say any way to get the online darshan..